The Warlocks are a group of students and mentors at Lockport High School in Lockport, NY. We participate in a program called FIRST Robotics. 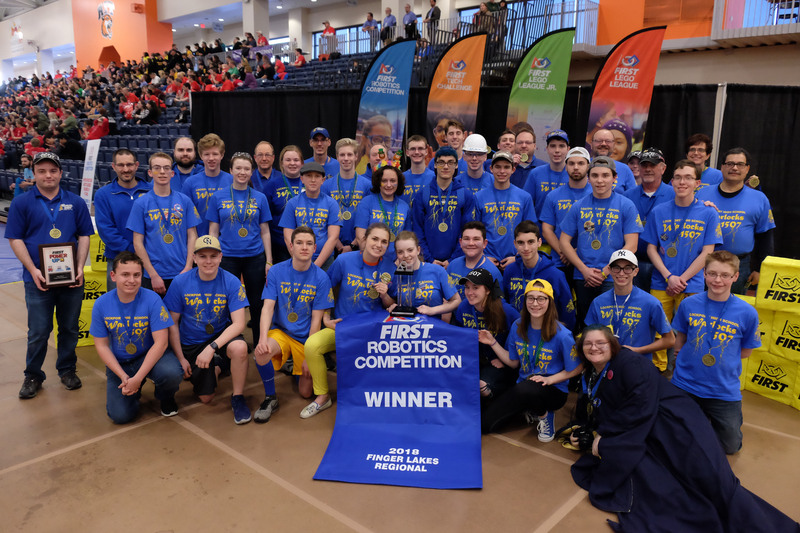 The team was created in 2005 to help encourage students to become interested in science and engineering through participating in an exciting program that uses competitive robotics to let them explore real-life engineering problems. As part of the FIRST First Robotics Competition (FRC) they are given a kit of parts each year and a game that they must build a robot to play. At competitions, they play not only against other school’s robots, but alongside them in alliances of three teams each. To succeed, you must not only have a good robot, you must work with others as well. There’s one catch: You only have six weeks to design and build the robot. But, it’s not really all about the robot. While emulating a sport to get the attention of our young people, the FIRST program allows them to try real-world engineering in a situation like they may encounter in a career in industry: not enough time, not enough money, hard challenges and choices to be made, working alongside others with different backgrounds, etc. The real goal of the team is to help students explore science, technology, engineering, mechanics, electronics, computer programming, design, and business; all in a way that is both exciting and engaging, and emphasizes cooperation, social responsibility, and personal growth at the same time. It’s a difficult challenge, both for the students and the Mentors who work side-by-side with them, but the rewards are great. We are continually gratified to see so many of them find new interests that they carry through their college studies and on into careers. The Warlocks began around 2003 when students and teachers from Lockport were invited to join the Newfane High School team, The Circuit Stompers, to learn about the program. Our main sponsor, at that time GM, wanted to start another team in the area and helped form the team. After two seasons with the Circuit Stompers, the new team was formed: Team 1507. The Warlocks are overseen by a parent organization, Lockport Robotics Inc. which is an incorporated, 501(c)(3) educational charity. This allows us to receive the support of the school district, as well as private sponsorship, while operating independently. We hope you find this site and our team interesting. Please feel free to browse the site where we explain much of the program in more detail and show off what we are doing. This site is a work in progress and will change as we add to it during the competition and build season.